When working with exponential equations, you may run into a question that wants the resulting equation (or a given equation) re-stated in relation to a different time reference, such as "in months" instead of "in years". Such questions do not want you to change the conditions of the problem. Instead, these questions simply want an equivalent form of the existing equation. 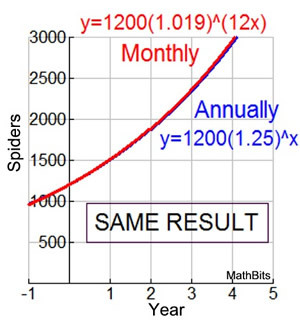 EXAMPLE: A study of the annual population of spiders in a certain area shows that the population, P(t), can be modeled by the equation P(t) = 1200(1.25)t, where t represents the number of years since the study began. Write an equation to approximate the population in terms of the monthly rate of growth. From the information given, we can see that there were 1200 spiders when the study began. 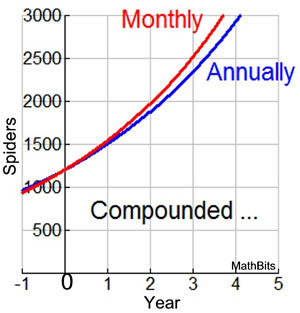 The given formula tells us that the population of spiders is increasing at a yearly rate of 25%. So each year we have all of the previous spiders plus 25% more of those spiders (100% + 25% more). 1 + r = 1.00 + 0.25 = 1.25. We see from these first three years, that the growth rate is being "compounded "
(the percentage, 1.25, is always multiplied by the previous year's population of spiders). The compounding is done yearly. Keep this in mind! by 12 to create a monthly rate of growth? By doing this, we are now compounding the growth monthly. The question is, will compounding monthly give us the same answer as compounding annually? Let's look at a graph and the computations of our situation after three years. After 3 years = 2343.75 spiders. After 3 years = 2520.899787 spiders. Comparing the rates of growth (or decay) will only yield the same results when both rates are converted to the same compounding period. In this example, the compounding period is "annually". So we cannot convert the problem to compounding "monthly" and expect to get approximately the same result. So, how do we get the equation needed for this question? First, we need to avoid changing the conditions of this problem. We do not want to set the problem up to compound monthly. We simply want to write an equivalent form of the same equation that will allow for the time period to be calculated in months. If we want to express the "time" in months, we need 12t in the formula, instead of t.
For example, for one year, t = 1, we want 12 months (12t = 12(1) = 12). yet keep the same equation? We will put our skills with exponents to work. Notice how we used the rules of working with exponents to place the 1/12 inside the parentheses. Remember, that raising a power to a power, multiplies the two powers. the monthly rate of growth is approximately 1.9%. Remember 1.019 = 1 + 0.019 and 0.019 = 1.9%. As the graph at the right shows, this new monthly based equation yields approximately the same results as the original annual equation. as we follow the growth rates of populations of gnats (a flying insect). The population of gnats increases yearly at a constant rate. In one year, the population increases from 600 to 680. Find the yearly growth rate (to nearest tenth) and express the yearly growth factor. Solution: The yearly growth rate is the percent of increase. The population of gnats continues to increases at this same yearly rate of growth for 5 years. Determine the 5 year growth rate (to nearest tenth) and express the 5 year growth factor. Solution: The diagram below shows how the yearly growth factor is multiplied 5 times throughout a 5 year period. This multiplication is equivalent to the yearly growth factor raised to the 5th power. The 5 year growth factor is approximately 1.867. To go from growth factor for one period of time up to growth factor for k periods of time, raise to the power of k.
Now, 1.867 = (1 + r) = 1 + 0.867 So, the 5-year growth rate (r) is 0.867 or 86.7%. The population of gnats continues to increases at yearly rate of growth of 13.3%. Determine the monthly growth rate (to nearest tenth) and express the monthly growth factor. Solution: The diagram below shows how a monthly growth factor is multiplied 12 times throughout a 1 year period. This multiplication is equivalent to the monthly growth factor (mgf) raised to the 12th power, and (mgf)12 = 1.133 (the yearly growth factor). To go from growth factor for k periods of time down to growth factor for one period of time, raise to the power of 1/k. So, to find the monthly growth factor, we need to solve the equation for mgf . So, the monthly growth rate is 0.010 or 1.0%. The yearly growth of a new population of gnats can be modeled by the equation G(t) = 500(1.182)t, where G(t) is the number of gnats, t is the time in years, and 500 is the starting population. What is the monthly growth rate of these gnats? Write an equivalent equation using the monthly growth factor. We have just seen that the yearly growth factor raised to the power will give the monthly growth factor. We need to introduce this power into our equation, without mathematically altering the equation. We do this by expressing the exponent t as which equals t.
Notice how we moved the into the parentheses to create the new monthly growth factor. We also now have a new equivalent equation, G(t) = 500(1.014)12t which expresses the situation using the monthly growth rate. Research shows that a gnat population of 1,000 gnats will increase every four years according to the model G(t) = 1000(1.133)4t, where 1.133 is the yearly growth factor and t is the number of 4 year periods of time. Write an equivalent equation that will utilize the 4-year growth factor. If we simply manipulate the placement of the components of the exponent, we will uncover the 4-year growth factor, without changing the equation. G(t) = 1000(1.133)4t = 1000(1.1334)t = 1000(1.648)t where 1.648 is the 4-year growth factor.